In this spoof of spy films, CIA agent, Kelly, is in Rio De Janeiro spying on a wealthy industrialist, David Ardonian, who secretly plans to turn the world sterile and repopulate it with his harem. UK spy, Susan Fleming, helps Kelly. Mr. Ardonian: [at Ardonian's study, Ardonan walks in and sees the Chinese agent Miss Soong waiting for him] I trust everything is in order . Who will be joining us this afternoon ? Wilma Soong: I don't know all I know they will be someone very high up. Mr. Ardonian: [pours glasses of whiskey and gives one to Soong] To our victory. Wilma Soong: And your profit. Mr. Ardonian: To your incredible beauty. I have a friend who is trying to lose some weight. To accomplish this, he recently went on a banana diet. Whenever he's hungry he just eats a banana. Well it looks like Kelly, the hero of this film, is on the same diet. He eats bananas throughout the movie, to comedic effect and at the most unexpected of times. The man eats a banana while dangling from the back of a moving speedboat! Then he casually tosses the peel into the water! It's a spoof of other spy films, but it never goes too far overboard with the parody like Austin Powers, which is what I love about it. The main character is not an unbelievable buffoon, but a smart, capable, sophisticated spy—not unlike James Bond but with his own, funny personality—with a few good one-liners and who appreciates a good banana. Sure, it's very cheesy at times, but that is balanced with a generous helping of action and a decent storyline, topped off with spot-on performances and fun dialogue. There is one stunt in particular, involving a helicopter and a well-known Brazilian statue that had me on the edge of my seat. This movie is both funny and tense. It's never boring, and every scene has something good in it. 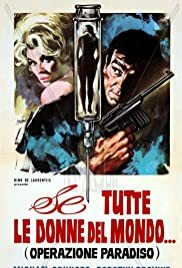 Mike Connors is great in the lead role, and he's backed up by some outstanding performances by Susan Fleming and Raf Vallone. However, I particularly enjoyed Terry-Thomas' pitch-perfect performance in the role of an unassuming chauffeur with a few tricks up his sleeve. I saw this film at a revival house in Los Angeles many decades after its release. I was initially intrigued because of the awesomely hilarious title and the strange but funny trailer I'd seen played the previous week at the same theater. Everyone in the theater laughed and had a good time, but after it was over I overheard some of the other people in the theater say that it was so bad it was good. I didn't get that feeling. I just felt like it was good. I haven't been able to find it on home video and I get the feeling that it never received a wide home video release, if any, but if you get a chance to watch it I highly recommend it.